Hundreds of people from all over the world, and across Indonesia, come to volunteer with us each year. Some stay for a few days, some a few weeks, while others work with us for months at a time. Volunteering with Friends of the National Parks Foundation is an adventure of a lifetime. It is a chance to work alongside local Indonesians at our project sites, learn about local culture, and take part in grassroots community development and conservation efforts to save Indonesia’s endangered species. We have opportunities available on Bali’s Nusa Penida island, home of our island-wide bird sanctuary, at our wildlife rescue centre and Besikalung Sanctuary on mainland Bali, and at our remote project sites in Kalimantan, the Indonesian portion of Borneo. Our volunteers take part in lots of different activities including working in our tree nursery, our organic garden, planting trees, or teaching English, art and sustainable farming. Our newest center at Pejeng was built to engage with the local community to protect the wildlife and their habitat, as well as support organic farming and develop sustainable tourism that will benefit the local population. 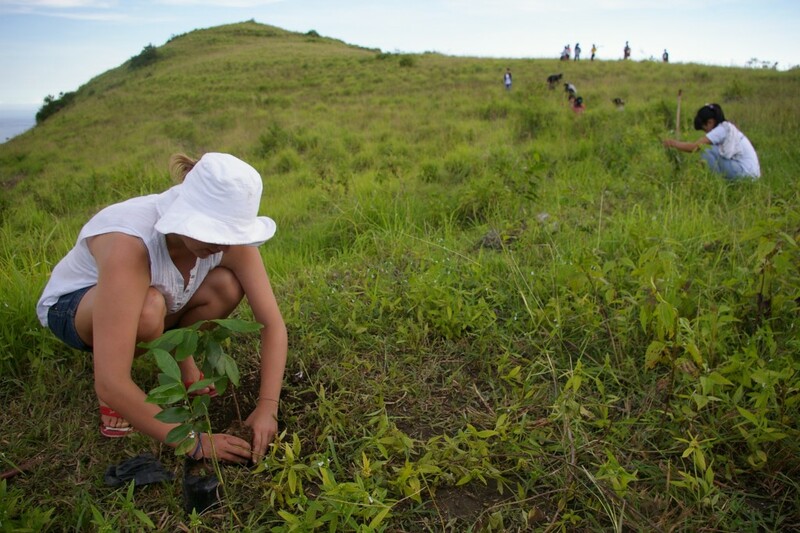 A volunteer helping us with reforestation efforts on Bali's Nusa Penida island, Indonesia. We are a non-profit organization, we receive no government funding and rely solely on the generous support of donors and supporters to carry out our work. Each volunteer makes a small daily payment, all of which goes towards covering the cost of running the volunteer program and helping fund our conservation projects. We also welcome a small number of long term volunteers with specific skills and experience to join us on a longer term basis – longer than three months. Long term volunteers work directly with our management team and alongside our staff. They must have considerable experience in a particular field, such as fundraising, marketing, animal rehabilitation and release, project management, financial management, graphic design, or IT. As a small organisation and only have the capacity to take a small number of long term volunteers. You can find more information here. Right now we have people volunteering with us from their homes in other parts of the world. These volunteers help us by spreading the word about the threats facing Indonesia’s wildlife, forests and indigenous people. Perhaps you can organise an event to raise awareness or money to support our work? Or maybe your business or employer can provide in-kind services to help us run our projects? We especially need help in writing grant proposals, graphic design, and accounting services. Please contact us if you think you might want to volunteer from your home or provide in-kind assistance. 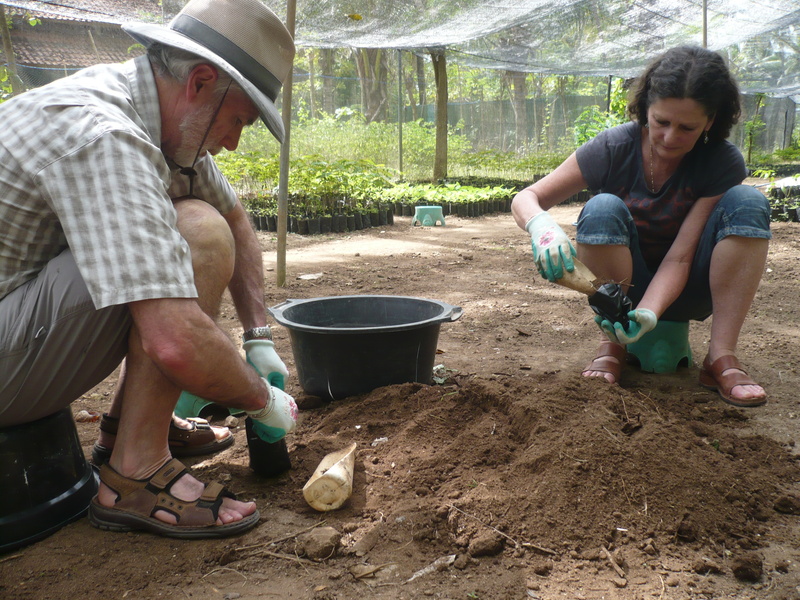 Volunteers helping us in our sapling nursery on Nusa Penida island, Bali.